During spring break, Central Arizona College students enrolled in the COM 263: Intercultural Communication course, along with faculty members, Dr. Sandy Rath and Professor Michelle Young, embarked on a study abroad trip to Tokyo, Japan. The course focused on exploring Japanese history and culture, learning about interpersonal communication patterns and discovering social practices and norms. While in Japan, the group had the opportunity to engage in Japanese language and experience the cuisine. 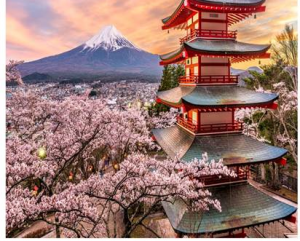 Their travels included visiting the several Buddhist Temples, Imperial Palace, Meiji Shinto Shrine in Shibuya, Ueno Park, the Tokyo National Museum, Lake Ashi, Mt. Komagatake, the Tokyo Stock Exchange, and Tsukiji Fish Market. Other highlights included attending a traditional Japanese tea ceremony and sushi-making class, and exploring the city. The group will share their experiences during two Japanese Experience Study Abroad Lunch and Learn sessions. Students, CAC employees and community members are invited to bring their lunch and join Dr. Sandy Rath, Professor Young, and students as they share highlights about their travels. The Japanese Experience Blog, written by Dr. Sandy Rath, Professor Young and the students can be read at https://sway.office.com/mr4QHASPuYZMwczz?ref=Link.